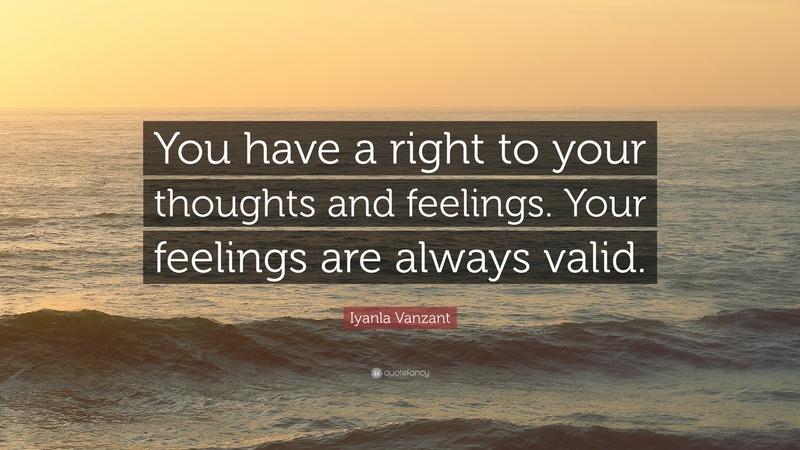 Your feelings are valid. Always remember that. We exist in microcosms and macrocosms, affected by the events of the wider world, and by the small day to day occurrences of our personal lives. Yes, there are terrible things happening in the world, and yes, there are people out there who likely have it far worse than you do. But that does not negate what you feel. That does not mean you aren't allowed to feel sad or scared or angry or anxious. Your feelings matter. It's important to remember the suffering that the world faces. It's important to remember that there are people out there living in terrible conditions, living with illness or poverty, or in war stricken countries, or have been forced to flee their homes. We should remember, so we can do whatever we can to help. We must be aware of our macrocosm, of the events that can shake our entire planet and its population. We each exist alongside millions of others, and therefore we must be aware of those others, and of the fact that our actions can affect them and their lives, rippling those affects on to more people, all across the globe. But just because there are people out there facing these terrible, terrible things, doesn't mean you aren't allowed to feel a certain way. Be grateful for what you do have, but you can still feel whatever it is you feel. We can only take care of others if we also take care of ourselves, and that means accepting, embracing, and dealing with our emotions. Maybe the thing making you sad or scared or anxious is pretty trivial in the grand scheme of things, but it could be something that overwhelms your own life, making it difficult to deal with anything else at the same time. Maybe what comes naturally, with ease to one person, is an uphill battle for another. And that's ok. You are allowed to feel what you feel, and no matter what the cause of them, those feelings are always valid. Don't compare yourself or your situation to others. Don't think that just because one person is coping fine with a situation, that means that you must also cope fine and aren't allowed to show a struggle. Don't think that just because someone's situation is worse than your own, that you must always be happy and grateful for your own circumstances. And if you are someone who is happy, and coping fine, don't assume that everyone else in a similar situation is feeling the same. Don't negate or repress your own feelings or the feelings of others. Don't apologise for them or feel the need to justify them. Don't be embarrassed or ashamed of feeling. Don't brush aside your struggle, or anyone else's, on the grounds that 'it could be worse' or 'you don't have it all that bad' or 'you should just get on with it'. Feel what you feel. Accept your emotions and face whatever is causing them. Express those emotions, seek help if you need it. Lend a hand to others and accept their feelings too. Even if your emotions seem irrational or unreasonable or extreme, accept them and feel them. Scream, shout, cry, run, jump, whatever. You are allowed to feel. You do not have to explain why you feel that way. You do not have to repress those feelings. Your feelings matter. Your feelings are valid.